Buzu is a dog that was living a lonely life in a cardboard box, on the streets of Romania. This heartwarming video shows what Buzu’s life was like before and after rescue. Someone had given him a blanket and food bowl, and both items were stolen. Who would steal a blanket from a dog? Buzu was in need of companionship and medical attention. Howl of a Dog was just the rescue group to step in and turn his furry little life around. They first had to earn his trust with doggie treats, and that was all it took. He was on his way to start a new life. Buzu had been living on the streets for a long time. He had fleas, had developed allergic dermatitis (a skin condition that resulted in some patches of missing fur). 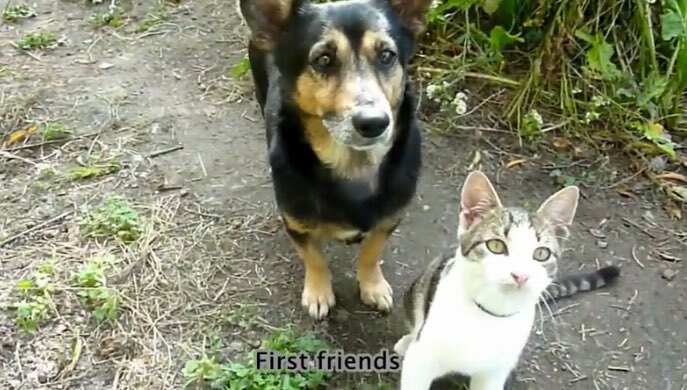 He is friendly with other animals and one of his first new friends was a cat. Buzu is now vaccinated, neutered, and microchipped. He is described as a happy dog that has a deep appreciation for all the things he did not have on the streets. Love, food and security. Update: Buzu was adopted and now resides in England. His new mom works with veterinarians and has a doggy day care. Sounds like Buzu is in good hands.